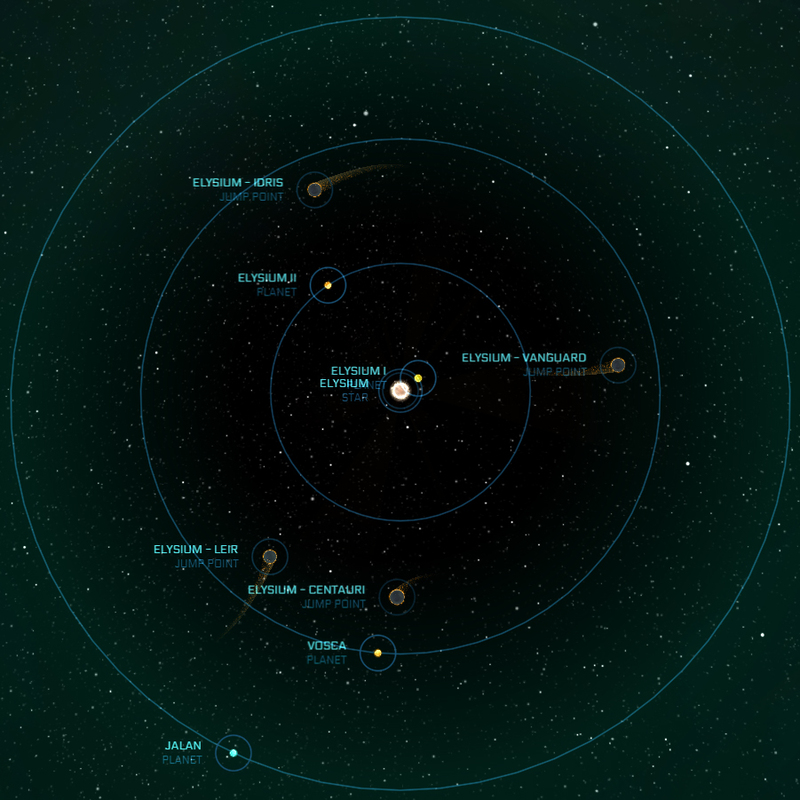 The Elysium system (Tevarin: Kaleeth’ala system ) is an UEE system captured from Tevarin after the First Tevarin War. It has a unique distinction in Human history; it was the flash point of our first interstellar war and site of the end of the second. It is the ancestral home of the Tevarin species. Elysium was incorporated into the UPE at the end of the First Tevarin War (2542-2546) and cleared for Human habitation. The system became the focal point of the Second Tevarin War (2603-2610) when the shattered remnants of Warlord Corath'Thal's fleet crashed into their former homeworld to end the conflict. Elysium is a Main Sequence Dwarf-F star. A rare example of a gas giant that formed in the outskirts of the system and migrated to its current orbit very close to the star. An uninhabited rock covered in deep impact craters. Scientists speculate that the planet was hit by a roaming asteroid. Tevarin historians have not contributed to this discussion. A sprawling arid desert, the surface of Vosca is a merciless environment. Inhabitants constructed the large arcology of Reza's Landing to shield themselves from the raging sandstorms. The former Tevarin homeworld of Kaleeth, Jalan is a beautiful alien world, known for its fields of stunning and bizarre rock formations. The planet still maintains some of the oldest Tevarin structures that managed to survive both wars. A handful of them (including a Rijoran Temple are located in Gemma, the capital city on Jalan. A distant, dead planet on a long orbit around the star.